Print and assemble your own wall mural from any image you want. YottaPrint is the first program ever that lets you create beautiful wall murals with any printer - even if its not color. A wall mural dramatically transforms the energy of any living space. Your peripheral vision engages you with the feeling that the room generates and this feeling is continuously shifted depending (of course) on the image used. Imagine being able to take any image and put it on your wall from the floor to the ceiling. 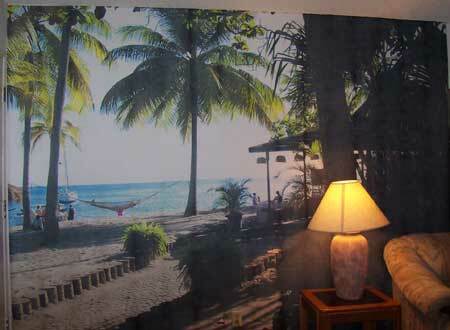 YottaPrint is the only affordable and practical wall mural option that exists anywhere. If you have been thinking about some form of wall mural, you don't have many options. 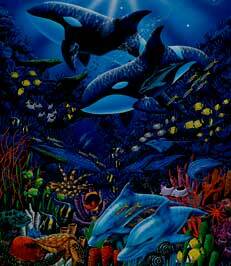 We always wanted to have a marine life wall mural which looks like a big window into an underwater world so that we can enjoy our dinner like being in an underwater restaurant. Murals where we live are hard to find and they are VERY expensive. Murals 60" X 44" in size would cost us more than $600! YottaPrint was less than $100 and now we finally have the mural of our dreams. Thank you. Background to the right was sent to us by this customer. It was used to create their beautiful wall mural. Want a high quality, low-cost wall mural?